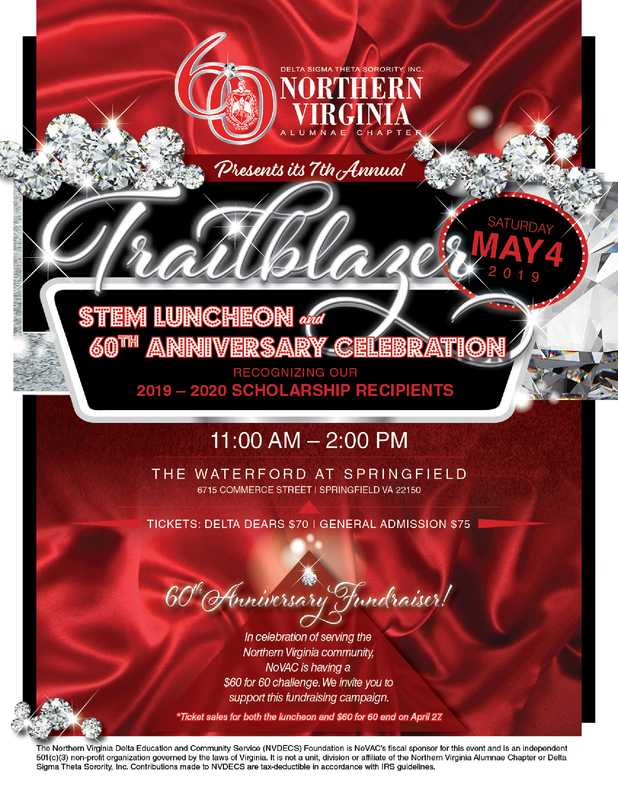 We will have the honor of recognizing our 2019-2020 Scholarship Recipients as well as celebrating NoVAC's 60th Chapter Anniversary. In celebration of the 60th Chapter Anniversary, NoVAC is having a $60 for 60 challenge. We invite you to support this campaign challenge, which ends on April 27, 2019. Payment Options: Trailblazer Tickets and Anniversary Campaign Challenge payments, may be submitted online or via mail. To submit online: complete this secure form and submit your payment. To submit via mail: complete a TICKET FORM and mail your check or money order made payable to “NVDECS Foundation” to: NVDECS Foundation, P.O. Box 2265, Arlington, VA 22202-0265. The Northern Virginia Delta Education and Community Service (NVDECS) Foundation is NoVAC’s fiscal sponsor for this event and is an independent 501(c)(3) non-profit organization governed by the laws of Virginia. It is not a unit, division or affiliate of the Northern Virginia Alumnae Chapter or Delta Sigma Theta Sorority, Inc. Contributions made to NVDECS are tax-deductible in accordance with IRS guidelines. If questions regarding this event, you may contact fundraising@dstnovac.org. You will directed to PayPal to complete your transaction.